Select ‘Download for SPARC – Text Install’. Please check MD5 checksun to ensure the downloaded file is not corrupt. After having downloaded this image, please write it to DVD using any ISO burner (such as Free ISO Burner). Connect to the system console either via ILOM, ALOM, XSCF etc through serial cable or SSH over the network in case of remote management configured. Login to the console, in my example a T2000 machine has been used. On SC prompt type console –f and console respectively and hit enter. You will now get OK prompt, if you powered on the server. Please note, you cannot do a version upgrade from Solaris 10 to Solaris 11. There are several differences in these two versions, many features are now obsolete. Solaris 11 has to be a fresh install. The pre-installation phase or requirements gathering phase will being. Oracle Solaris 11 will ask several questions with options to you. The first step is to select the keyboard layout of your choice. Defaut keyboard layout for Oracle Solaris 11 installation via DVD is US-English. Next, select the language of your choice, default installation language for Oracle Solaris 11 is English. Next step will give you an option to Install Oracle Solaris. If you are using a remote ssh session on shell, I would rather select 4 Terminal type and specify the correct terminal type I am using, in order for me to have a aligned display of the installation screens. The next page will give you further details about this. Select option 4 and select the correct terminal type. vt100 is your best if you are unsure about what terminal type are you using. 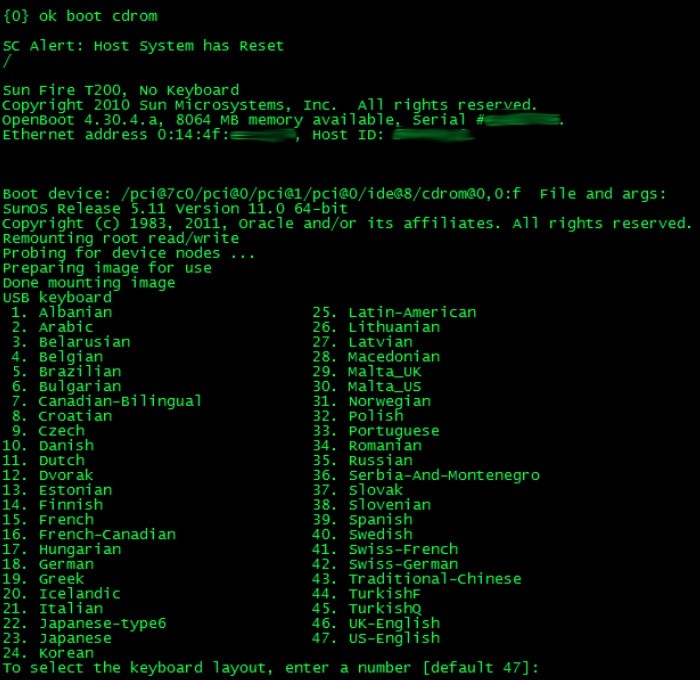 While installing Oracle Solaris 11, the screen type chosen here will help you a lot. Select 1 to install Oracle Solaris 11. As you can see 1 is the default value, hence you can just press enter/return key here. Next screen will show you the location of installation log, which is /system/volatile/install_log. Remember, from here until completion of install Oracle Solaris 11, you can move to forward screen by pressing F2 or to quit you can press F9. After you are on next screen of Solaris 11 installation, you will have the disk option, disk where Oracle Solaris 11 will be installed. Very important point to note and also, a considerable difference from Solaris 10 to Solaris 11 is noticed in this step. Solaris 11 is installed on rpool. Yes, zfs is the default file system of Oracle Solaris 11. To remind you, Solaris 10 has UFS as default file system. Select the desired disk, I would recommend a whole disk for the installation, however, you have the option to install it on a single slice. Now, Oracle Solaris 11 installer will give you option to choose a hostname. Type any name that you want. If you want to change it later, you can change hostname from Solaris 11 operating system once the system is fully installed. The default name is solaris. You will also get options to choose from regarding how would you like to setup networking on the machine. If you are using DHCP you can select ‘Automatically’ or if you know the IP address, netmask value and gateway address, you can select Manually and provide these details for an interface to be plumbed and IP configured. Alternatively, if you are experienced with Oracle Solaris 10, you can choose ‘None’ to manually plumb and configure network interface later, after the Operating System is installed. Next screen to set password for root and user account for yourself. Next screen is Installation summery, verify and press F2 if everything correct. Installation will take around 15 to 20 minutes to complete. Here you can see installation progress. Installation completed, press F8 to reboot.